Ellie Marney was born in Brisbane, and has lived in Indonesia, Singapore and India. Now she writes, teaches, talks about kids' literature at libraries and schools, and gardens when she can, while living in a country idyll (actually a very messy wooden house on ten acres with a dog and lots of chickens) near Castlemaine, in north-central Victoria. Her partner and four sons still love her, even though she often forgets things and lets the housework go. Ellie's short stories for adults have won awards and been published in various anthologies. 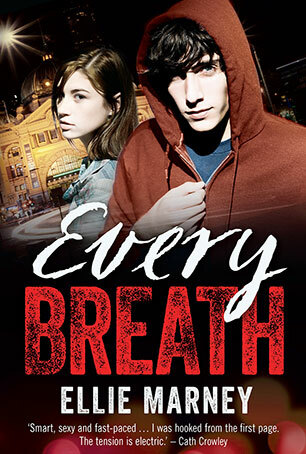 Every Breath is her first novel for young adults. When I first picked up this novel, I intended only to read a chapter or two to familiarise myself with it, and to return to it later. Instead I found myself a few hours later finishing the whole book and looking for the sequel. Every Breath is the story of seventeen year old Rachel Watts, whose whole family has been forcibly and not very happily transplanted to inner Melbourne after their farm had to be sold. She tries to make the best of her situation and support her family, and spends whatever leisure time she has with her neighbour and friend, James Mycroft. Mycroft, a troubled, intelligent and driven boy, christens them the investigating team of ‘Mycroft and Watts’, after ‘Holmes and Watson’. Mycroft is dedicated to the study of forensics and the examination of crime, and Rachel follows him into his investigations. After finding the body of a friend, a homeless man named Dave, and determining that he had been murdered, Mycroft becomes obsessed with solving the case and tracking down the perpetrator. With the exasperated and suspicious police watching them, dangerous individuals at large, and troubles at school and at home, solving the murder of Dave threatens to cost them both a great deal. I loved the setting of this book, seeing Melbourne and its geography play a key part in the action. What kept me turning the pages, however, was not so much the plot but the characters. Mycroft is an engaging creation and all the key characters and their friends seemed original and authentic. I really was invested in seeing how the family and relationship dynamics worked out. There was also a refreshing absence of a love triangle, a device which seems to dominate the plots of most teen fiction these days. Instead there were other conflicts and dilemmas to drive the narrative and propel the story forward. Given the age of the main characters and the nature of some of the subject matter, this book would be great for older teens and more mature readers as it is engaging and challenging. The Melbourne setting was appealing and of particular interest to Victorian readers. The story would have wide appeal for girls, but I could see boys enjoying it as well. It was a very entertaining read, and I look forward to the continuing adventures of ‘Mycroft and Watts’. Sherlock Holmes has made a big comeback in recent times. There’s Robert Downey Junior’s action interpretation on the big screen, Benedict Cumberbatch in the innovative modern Sherlock (UK series) with its own real Sherlock and Watson blogs and Jonny Lee Miller in Elementary (USA series), showing that Watson can be female. So it’s not at all surprising that a young adult book series would capitalise on the popularity of Arthur Conan Doyle’s most famous creation. Every Breath is the story told from Rachel Watts’ point of view, as her delinquent but brilliant friend Mycroft coaxes her to solve a murder mystery. They are the “Sherlock” and “Watson” team, though interestingly our brainy detective is named after Sherlock’s supposedly-brainier brother. The book is open about its references to Doyle’s characters and the characters acknowledge that they are named after them, which is somewhat refreshing. It’s a fun take on the Sherlock franchise, and a good murder mystery. In this story, Watts and Mycroft befriend a homeless man who is murdered, and seek to find out who killed him. Through observation and solving puzzles, they try to figure out the answer to the crime, as well as work through the usual angst of being a teenager – budding teenage romance, oppressive parents and problems with school and siblings. Rachel is a likable “country girl” heroine trapped in the city and Mycroft a mysterious rebellious teenager, which reflects a bit of the Baker Street duo of Doyle’s creation. Be warned, though, that although this may be capitalising on the popularity of Sherlock nowadays, unlike, say, the television shows recently, this book is not a “modern adaptation” or a “teenage adaptation” of one of Doyle’s popular books. There’s not a hint of A Study in Scarlet or A Scandal in Bohemia about it. It’s a new, original mystery story borrowing the Baker Street names and some of the ideas from Doyle eg the logical analysis of crime and the emphasis on observation. As well as some of the phrase traditionally associated with Sherlock and Watson eg “elementary” and “The game’s afoot!”, many of which have grown more in popular culture and were not used that much in the original Doyle books anyway. This may be considered a bonus to many readers – a new, original story – but some Doyle fans who wanted to read yet another take on the Hound of the Baskervilles might be disappointed. The story itself is a bit far-fetched as is the way the duo go about solving it, but that’s to be expected, they are teenagers trying to outwit the police force as well as balance school and their romance on the side, so you have to suspend disbelief at times. But it’s an engaging read if you can do that. This story is good at introducing students to the Sherlock Holmesian world and could start a discussion about Holmesian adaptation and get students started on reading some of the first stories on Holmes. Why has Holmes become such a cult figure and what has he added to literature and indeed the world of detection? How does he differ from other literary detectives? How well do Ellie Marney’s characters represent Doyle’s ideas? Another important concept that is brought up is Rachel’s desire to go back to the country and the pressure to “do something with her life”. What sort of expectations do students feel they have in order to create certain kinds of futures for themselves? What do they think is important in their own future – and do they even think about it much? Why or why not? What influences their choices? What do they think Rachel should do? Rachel Watts and James Mycroft make an engaging duo and I’d be really interested in following this series – I just would expect it to diverge further from the foundation built from the Doyle names it was based on. However, as a mystery series it is a good, fun read and as a romance the two are an interesting and original couple. Rachel Watts and James Mycroft: teenagers with problems. James lives with his aunt and has a tragic past that he keeps secret. Rachel has moved from remote rural Victoria following the foreclosure of the family farm. They are friends and neighbours and neither wants to be where they are. Watts wants to back in the country and Mycroft, in a household where there are underlying suggestions of domestic violence wants to move away from his aunt as soon as possible. One night, on a regular visit to catch up with their friend Homeless Dave and his dog Poodle, the ordinary quickly turns to anything but when they discover Dave with his throat cut, dead against a tree near the zoo. Detective Pickup is certain the murder is a thrill killing, but Watts and Mycroft are not convinced. The two decide that in order to see justice done they need to investigate the killing themselves and perhaps even find out a bit about their dead friend and the missing Poodle along the way. Mycroft, already a forensics whizz with an online profile, uses his scientific knowledge to assess the evidence and piece together a motive and a possible perpetrator. The missing Poodle might have the answers they seek. As each of their personal lives reach a crisis, finishing school, staying in the city and just surviving become uncertain. The big question is can they still be friends at the end of it all. Every Breath is a fast paced thriller with strong, likeable characters that we care about. The novel is about coping with the challenges that life throws at you and managing change in a positive way. This book has a great sense of place, solidly anchored in Melbourne with frequent mentions of trams, trains, the zoo and the gardens. Rachel Watts, hip and savvy 17 year old girl and former country girl has found the moved to the big smoke unsettling, especially when her parents lost the family farm. She doesn’t want to be a city girl and longs for the large outside space of what the country had to offer; cows, sheep, paddocks, big skies, trees and grain fields. But unfortunately her family had to move to the city to get work. Rachel is the main homemaker as she does all the cooking and cleaning for her family while her parents and brother work to earn money, as well as going to school, studying and doing her Year 12 homework. She finds it hard being so dislocated from her country roots but there someone who intrigues her, a boy, a near neighbour and classmate that helps her to reconcile into inner city life. James Mycroft, is a forensics geek, who likes to dissect and prod the field of criminological science, a boy CSI! When a homeless man that they both visit ends up dead, Mycroft deducts that he was murdered, and so this teenage “Holmes and Watson” aka “Mycroft and Watts”, decide to investigate the mysterious dead of their friend. Their investigation leads them on a merry path around inner city Melbourne ending up at the lion enclosure at the Zoo. Will it be curtains for Mycroft and Watts or will they end up catching the murderer? This was a great book to read and set a cracking pace. The story covered mystery, tension, suspense, discovery and romance, a bit of something for everyone. This book is probably more suited to girls than boys given the cover and the romantic tension between the main characters but could be sold to boys given the murder mystery theme. I cannot wait for the next book in the continuing story of “Mycroft and Watts”.